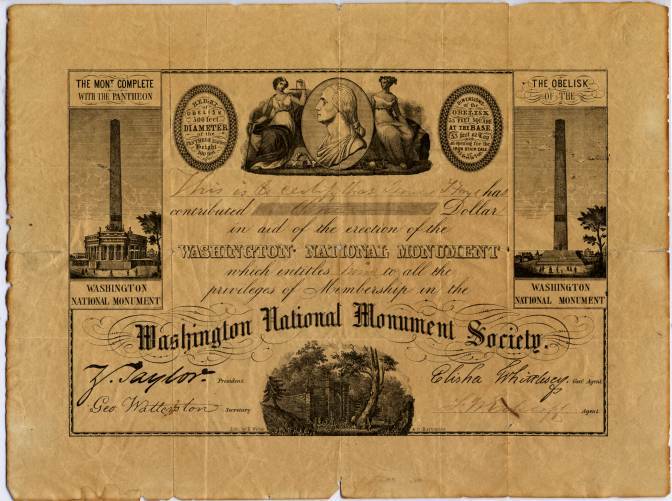 Beautifully printed Certificate from the Washington National Monument Society issued around 1849. 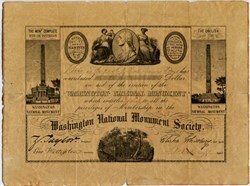 This historic document has an ornate border around it with vignettes of George Washington flanked by two allegorical women, the monument complete with the Pantheon, and the Obelisk of the Monument. The Pantheon was never completed. It also shows the height of the Obelisk was to be 500 feet, but it ended up being 555 feet. This has the printed signatures of various society members including President Zachary Taylor and it has the hand signature of the Agent. This document is over 159 years old. Toned and reinforced on verso. This would look terrific framed!